For those scratching their heads and wondering whether Lisa and I have lost our minds, what with the bricklaying and so on, I would like to report that we don’t always do everything ourselves. Case in point: yesterday we had a tree surgeon out to remove some damaged branches from the enormous evergreen in our back yard. The branch removal mostly got the lowest hanging branches, which has the not entirely coincidental effect of making the back yard a lot brighter. So the second public beta of Apple’s new browser, Safari, has been released. I was curious to see if any of the display glitches it showed on my site had been fixed. 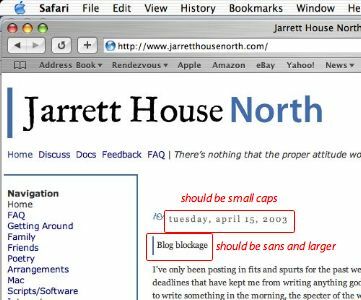 As you can see from the adjoining image, the answer is “not quite.” Still outstanding: my date titles should render in small caps, and my post titles should render in a larger sans serif font. I’m starting to think that the post title problem is my fault, though, for using a misplaced DIV to trick Internet Explorer into rendering my page correctly. At least my page renders completely in Safari now. I’ve only been posting in fits and spurts for the past week, and I think I know why: I’ve had a ton of deadlines that have kept me from writing anything good (even when I wanted to); and whenever I want to write something in the morning, the specter of the war raises its head and makes me want to write something else. Anything else. I need to write something most days to jump start my brain, but writing about the war, or about the domestic and international politics that surround it, either enrages or depresses me most days. I’ll keep working on it. If history is any indication, I’ll suddenly have a bunch to say after I finish my next deadline.